Are you searching for RRB Group D published result? We are providing a result publication date of Cen 02/2018 with the logic. One of the biggest recruitment in Indian history is RRB Group D under the notification no Cen 02/2018. 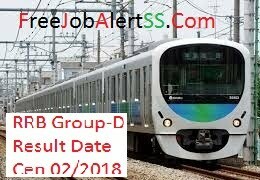 62907 total group D vacancies fill up notification were published and invited online application from eligible and interested candidates. The online computer based test was scheduled for three months. The RRB Group D recruitment exam was taken three shifts each day. Most of the candidates attend this exam with the dream of a railway job. on 11th January 2018, RRB Group D released the answer key. If you have completed your exam then you can check the answer key. Freejobaleretss providing you with the link to check. Go through the following link and put your registration no and generate your answer key of the exam under notification Cen 02/2018. Check the Answer key. Click here. When will publish the Cen 02/2018 Result? just completed the exam and result will be published very soon. When result will be published on the official website of Railway Recruitment Board we will put a link below to check your outcome. Wait and touched with us for updates. There is a chance to published result very soon because we have seen the before ALP result published very quickly. you may continue read some other information related to RRB Group D Result date information. Check Railway Group D Result → Click Here Link will be updated when RRB Group D Result Date will be got. The result may be published on January 2019. Check this video to get an idea. After publication of Railway Recruitment result above link will be updated. Then open the official website through that links and follow the steps. ♦Search for the exam result of notification or Cen 02/2018 or look for the RRB Group D Exam result. ♦Click on Source and a page will be appeared some boxes you can see for putting roll no and date of birth. ♦Below roll no and date of birth boxes you can see another box for captcha code inputting box and an image containing with some text. See carefully and put all character properly and hit the submit button. ♦Finaaly you are done. And your result will retrieve whether you are qualified or not. Hope for the best. How long time will take to Publish Result? The online exam competed of the Cen 02/2018 notification. And candidates are waiting for the merit list of successful candidates. As you know that this is the biggest competitive exam for railway employee recruitment in India. And also, you may know that the Railway Recruitment Cell is divided into 22 Railway Recruitment Board and vacancies create and recruit on the basis of zones. Though the exam is taken centrally by the same question for a single sift. And merit list is prepared on the basis of zones not centrally. If you select a zone for the competitive exam at the time of online application submission then your merit will be prepared on that zone according to vacancies. And cut off also made on the basis of appeared candidates in the CBT of that zone. indian Railway Recruitment Cell will select candidates as a group D Employee through the following steps. ♦ Successful candidates of Computer Based Test which you have appeared. ♦ After qualifying CBT Test, RRB will check your Physical Efficiency Test which we called 'PET' in short. ♦ Original document verification will also be made. it will be check manually by officers. ♦ Finally Medical check up before appointing candidates as a group D employee of Indian Railway. 1. Huge no of candidates has appeared on the computer-based test. So you can not predict like other exams. 2. There are 60907 vacancies are shown on the Notification Cen/2018. Maybe increase vacancies at the time of recruitment. And how many vacancies will be an increase or decrease no one can predict. And no official information to the public. 3. Different cut off marks are comes according to zone, vacancies and applied candidates. So it is very hard to predict Railway Group D Cut off marks. 4. The normalised mark is an important factor(See below about normalised marks). So it is very hard to calculate/predict. So it is better to wait for the official result announcement. Also Read, Latest recruitment notification from below linked pages. What is RRB Normalised Marks? As we mention some factor of Zones, Vacancies, Exam-sifts, post name and appeared candidates in the exam for this recruitment. So you can not say that all exam paper are equal according to the hard and easy question ratio. Some sift question easier in comparison to other sift and vice-versa. For this reason, the Railway Recruitment Board prepares normalised marks for all sift. For example, you have appeared on a sift which question was harder than your friend sift. The question of your friends sift were very easy and most of the candidates score 70% marks whereas your sift were hard and candidates are able to score 50%(Average). For this, to justify properly RRB makes normalised marks. And normalised marks may increase or decrease than the accurately obtained marks in your exam. So, don't be hopeless if you had appeared on a hard question sift. Normalised marks will balance all sift and a quality outcome will be published. No one does not know what is the RRB Group D result Date exactly? Official notification is not published so we can not say the proper date of result Announcement. but we can a predict for it. The exam is taken online computer based test so there is no time will take to evaluate the exam paper. Electrically it can be done by computer. We have seen ALP result were published very soon. So it can be published within one or two months. Please note, RRB NTPC exam were taken through CBT yet it takes a long time to publish the result. Both type of experience we have. So, we can not strongly predict. And our prediction may be completely wrong, so we recommend don't depend on us just think on logically and wait for the official announcement of RRB Group D Result Date. You may follow the following official website to get the update news. We hope you got the idea which we want to say. We speak about only on prediction.